Magical Mermaid Clear-Mount Stamp Set | Mermaid Stamps | Stampin Up! Do you remember when you were a little girl, and all you wanted to be when you grew up was a mermaid? Well chances are that it didn't happen. 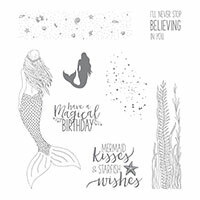 Luckily you can still have this dreamy mermaid stamp set as a fantastic consolation prize.